In the latest Burning Ambulance podcast, bassist Melvin Gibbs and I discuss a wide variety of subjects related to his 40-year career in New York and around the world. One of the things we talk about is the late ’70s/early ’80s movement in jazz that encompassed harmolodics, “free funk,” No Wave, and related sounds. Between Ornette Coleman‘s Prime Time, fellow alto saxophonist Arthur Blythe‘s bands, guitarist James “Blood” Ulmer‘s groups, drummer Ronald Shannon Jackson‘s Decoding Society, and various groups led by another Henry Threadgill (another alto saxophonist), there was something in the air. Jazz and funk combined and swirled together, with most bands featuring at least one electric guitar and electric bass (the Decoding Society had two bassists for several years, and Prime Time eventually had a double rhythm section, with two bassists and two drummers). A lot of this music was fascinating. With its complex, layered polyrhythms and tangled harmonies, its keening lead horn lines surrounded by jangling guitars, it mimicked the constantly busy sounds of New York City’s streets in a way nothing since Miles Davis‘s On the Corner had done. But in some ways it was hampered by the technology of its time. Recording engineers and primitive digital equipment (Ornette’s Of Human Feelings, from 1982, was recorded to digital two-track, and sounds like it) failed to capture the fullness of the music, and many of the albums have a shrill, twitching-nerve sound that’s frankly hard to listen to. Arthur Blythe, who was signed to Columbia and had the use of the best studios (and had a tuba to give his bands extra low end), fared the best out of all of these guys; his albums Lenox Avenue Breakdown and Illusions are some of the best jazz to come out of late ’70s New York. 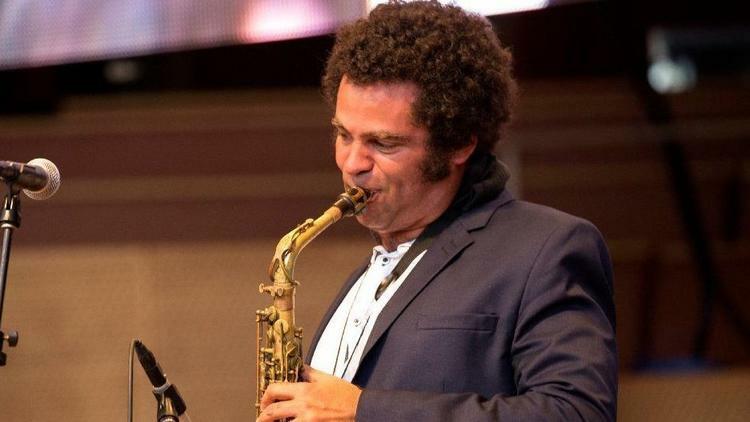 Chicago-based alto saxophonist Greg Ward, whose previous project Touch My Beloved’s Dreamwas an interpretation of Charles Mingus‘s The Black Saint and the Sinner Lady (I interviewed him about that here in 2016), is excavating the old neighborhoods the free funk players wandered on his latest album, Stomping Off From Greenwood. The music was recorded with a five-piece band, Rogue Parade, that includes guitarists Matt Gold and Dave Miller, bassist Matt Ulery, and drummer Quin Kirchner. Before tracking the disc, the band did a month-long residency in Chicago and some Midwestern tour dates, so there’s a confidence to their playing and a cohesiveness to their sound that can’t be achieved just by gathering some musicians in a studio, no matter how professional or talented they are. The album kicks off with “Metropolis,” driven by a forceful funk beat from Kirchner and bouncing electric bass from Ulery. Gold and Miller come in slowly, playing against each other—strummed chords in the left speaker, balanced by an almost African rhythm line in the right—and Ward occupies the middle, keening in the alto’s upper register. At the bridge, the guitarists crank up the distortion, offering a big rock riff, before the music goes back into jangling funk. By the end, Kirchner is slamming out a double-time rhythm, creating a feeling of powerful momentum even as the rest of the band seems to float in midair. Ulery occasionally switches from electric bass to upright, as on “Black Woods”, which begins with a lengthy bass solo, first plucked and then bowed. When Ward and the rest of the band come in, two minutes into an eight-minute piece, the saxophonist’s gentle probing of the melody brings to mind Ornette Coleman‘s crying balladry, and the guitarists’ interweaving lines have a deep blues feel. The album changes moods slightly in its second half. A version of the standard “Stardust,” the only non-original tune on the disc, has an almost country feel at the beginning; it reminds me of something Bill Frisell might do. Frisell was in the trio Power Tools with Melvin Gibbs and Ronald Shannon Jackson, though, so that connection remains, and Ward’s alto is warped slightly by effects until it sounds like a violin, bringing to mind Akbar Ali‘s playing with the Decoding Society on Earned Dreams, a live recording from 1984. “Sundown,” the album’s final track, is a slow-burning piece that brings the music softly to earth. It reminds me of the instrumental “Asleep in the Desert” that closes out ZZ Top‘s weirdest album of their pre-MTV period, 1976’s Tejas. The guitar soloing gets fierce at times, but the piece is always held down by Ward’s patient alto and Kirchner’s hammering but steady beat. Greg Ward is a conceptualist—every time he makes an album, it’s the result of extensive thought and careful planning. As a result, each one is different from the others, but they’re all worth hearing. Start with 2011’s Phonic Juggernaut (reviewed here), but make sure you wind up at Stomping Off From Greenwood, because it’s one of the best albums of the young year.